Astoria Dog Owners Association is presently involved with efforts to build a new dog run in Astoria. Currently, [most] parents of dogs have three options for exercise and socialization: off leash hours at Astoria Park early in the morning or late at night, Bugsy’s Dog Run adjacent to Astoria Park, or walking their dog on a leash. With the inconvenience of off leash hours for many, safety and practical concerns at Bugsy’s and walking dogs on leashes not providing space to run, play, or socialize, ADOA is committed to providing the community another option without sacrificing the resources we already have. This means not building a dog run in Astoria Park (to ensure we do not loose off leash hours), and not renovating Bugsy’s. For more information on why these two places are not options, please click here. Astorian’s voices have been heard; we will be getting our very first dog run, to be built at Triborough Park C. Thanks to Participatory Budgeting and the community’s vote, we secured $500,000 in funding for our dog run. Additionally, Queens Borough President Melinda Katz, and State Senator Michael Gianaris generously allocated an additional $500,000 (current estimates from the NYC Parks Department have the price tag at slightly over $900,000 rather than the initial million dollar estimate). This money will ensure that the expensive tasks such as providing necessary water access to the park are possible, as well as guaranteeing a revamped basketball court, improved sidewalks, and better drainage. Early during the summer of 2016, members of the Astoria Dog Owners Association met with public officials to discuss the design for the dog run, which was released publicly in August. We are pleased to announce that our park will have a large and a small dog run with double gated accesses, water access (and a sprinkler), climbing structures (rocks like those at Hunter’s Point), a storage locker for cleaning supplies, a 6 foot high fence, and benches. Additionally, the city plans to paint a big dog bone in the center of the run. The adjacent basketball court will also be renovated. You can learn more about the design for the proposed park, and how it aligns to our initial vision here. A contractor has finally been secured (as of November 2017), and current estimates are that we should break ground on the new park by April of 2018, and have a completed dog run by April 2019. We will continue to update the community as we receive more information, and you can track ongoing progress towards building the run using the NYC Department of Parks and Recreation’s Capital Project Tracker. 1. Communicating with public officials regarding planning the details of our park. 2. Working with community groups and our public officials to make our park a reality. 3. Ensuring the safety and well-being of our dogs now and in the future. 4. Raise awareness about our park and ensure we are speaking for our community. 5. Serve as a liaison between public officials and the dog owners community in Astoria regarding the dog run. 6. Advocate on behalf of Astoria’s dogs and dog owners. Triborough Playgrounds C [the approved site] is an ideal candidate for a new dog run given it is unused parks space, centrally located, and far enough from residential areas to limit noise disruption and far enough from Astoria Park as not to affect off-least hours. These short term goals and objectives are fluid, and will change over time. However, our primary organizational focus at this time is solely allocated to the planning and building of a new, safe dog run for our pups. 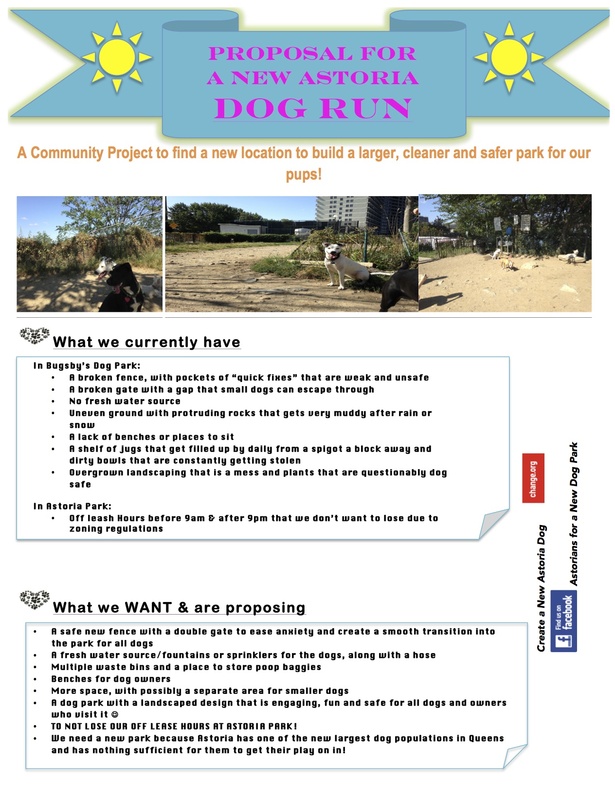 To learn more about why we need a new dog run in Astoria (and why the resources we currently have are not adequate), please click here. To learn more about what our vision is for the new park, as well as get details of how this vision aligns to the proposed amenities in the design released by the Parks Department, please click here. To view press releases from the Councilman’s office regarding this project, please check out our Collaborations page. To track the city’s progress towards building the run, use the NYC Department of Parks and Recreation’s Capital Project Tracker.